You’ve studied their resume, conducted an interview, gone over their achievements and are convinced they are the ideal candidate for the job. Now it’s time to cross reference the information you have compiled and verify the individual’s work performance, experience and cultural fit by speaking to an independent third party. Reference checking is an essential component of the hiring process and should uncover any misrepresentations stemming from a CV or interview. More often than not though, it is flawed from the start. As referees are chosen by the candidates themselves to speak on their behalf, how can you garner the confirmation you need without overstepping any legal or ethical boundaries? Reference checking is the most substantive way to verify the skills and information from their resume and interview, aside from expensive psychometric and skills evaluations and is particularly important in accounting recruitment. Drawing on the details provided by a referee, together with all of the other inputs you have had throughout the process, strengthens the image of an applicant, helping you to reaffirm the candidate’s account of their experience, previous positions and qualifications. 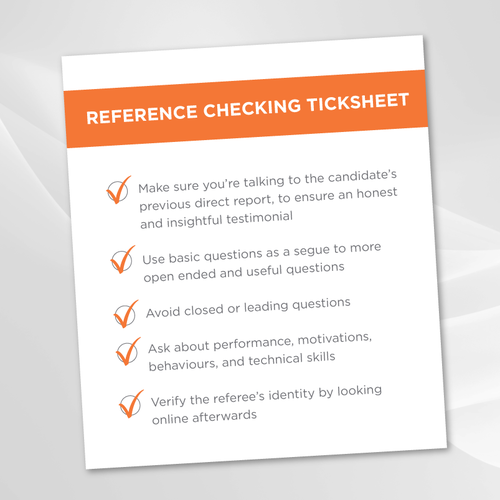 What’s more, should there be more than one ‘ideal’ candidate, a reference check can create an equal opportunity for each candidate in the final stages of your recruitment process. Those who don’t interview perfectly but are potentially worthy employees in other ways can be identified, as can those who might be great in an interview setting, but can’t back their claims up with performance in the workplace. While references are a vital tool, they aren’t without their drawbacks and limitations. First and foremost, the candidate is essentially in control of who you can speak to. It certainly wouldn’t be prudent of them to provide a referee who isn’t positive about their past performance and skillset. Whilst it is essential to approach a reference call in a positive way, it is important to always take the referee’s feedback with a degree of caution, even if it comes from a former or current manager. Remember, the candidate has handed over this person’s contact details for a reason. Watch out for red flags, such as a candidate only providing referees from companies in the distant past, or details of colleagues rather than managers. This may or may not be a sign that they aren’t confident that their more recent managers will provide them with a positive reference. If you’re faced with this situation, question the candidate about why they are unable to provide a more recent referee. Most of us these days wouldn’t buy a second-hand car if we didn’t have an accurate log book to review! You are well within your rights to request that the candidate provides you with a current or previous manager to speak to. For example, if they are currently employed, you may find that they are unwilling to provide their existing manager as a referee for fear of sabotaging their current employment status, understandably so. If the candidate has been in their present role for some time, this obviously poses a bit of a challenge. A suitable alternative to this could be to speak to a trusted manager or peer that has exited the business recently. You may also encounter organisations who have stringent policies around providing references. For example, some only allow referees to confirm that the individual worked for them and the dates associated with their tenure. To ensure you are confident that the candidate is who they say they are if you’re confronted with this situation, there is no reason you can’t request additional referees. The last major red flag to watch out for is when the referee isn’t aware they have been nominated for a reference. Without jumping to conclusions, this maybe a sign of poor communication skills, giving an insight into what you could expect from the applicant if you were to hire them. Contrary to what many believe, hiring managers regularly reach out to mutual acquaintances that haven’t been provided by an applicant. However, you should always gain consent from your candidate to confirm that you are able to seek further clarification from people outside of those that have been provided. Considering there could be legal consequences should they believe that their privacy has been breached by a previous employer, due to possible defamatory or subjective comments, it is essential to abide by best practice. The blueprint for thorough reference checking embodies questions that are specific and related to the skills or experience required for the role. Focus on asking open-ended questions and avoiding leading ones. Often basic questions such as “What was the candidate’s tenure?” or “What was his/her role and type of work?” provide a good segue to more valuable topics. In addition, questions around performance, motivations and behaviours, as well as technical skills, will paint a more complete candidate profile. Obviously, questions that could be seen as being discriminatory or offensive are obviously a no-go. Be mindful of topics such as marital status, religion, physical appearance, ethnicity, disabilities, sexual preferences, age or other personal queries, unless you can establish that they are a requirement of the role. What are the Boundaries of Modern Day Reference Checking? Given the average Australian spends over 20 hours a week on some form of social media, it is logical that there is also an increased trend of these sites being used to background check candidates. While the information is publicly available, legal to access and seems like a reasonable resource to investigate, it doesn’t come without risk. Using social media as part of your decision-making process could increase the risk of a claim via the Fair Work Act 2009. Not just that, the legal implications should an employment decision be made based on information gained from social media can be significant if it is deemed to be discriminatory. Therefore, the best advice is to avoid using social media as part of your checking process. Should You Consider Outsourcing References? Best practice dictates that the person directly involved with the hiring process should also be the one orchestrating the dialogue with a referee. While referencing outsource companies do exist, they are mostly designed for high volume recruitment, meaning that they aren’t equipped to engage in comprehensive, probing conversations. There is also a lack of affinity with the employer, candidate and the role. If you’re working with an accounting recruitment partner then your recruiter is well placed to conduct the reference check for you as part of their service. At Richard Lloyd, our team are not only experienced at interviewing referees, but because we are directly in touch with your hiring process we are also better able to pick up on potential red flags if they present themselves. The costs associated with investing in a new employee can be considerable, so it is essential to maximise the opportunity to check that a candidate is the right choice. References help to safeguard your decision to hire by obtaining independent information about your applicant to validate their experience. There are a myriad of laws governing reference checks and in some instances the lines of what is acceptable and what isn’t can be blurred. If in doubt, always seek advice from your in-house legal team or workplace employment lawyers. If you’d like to find out how we can assist you with sourcing the best suited accounting candidates for your business, or help take the steps in cultivating your accounting career further, please contact us today.